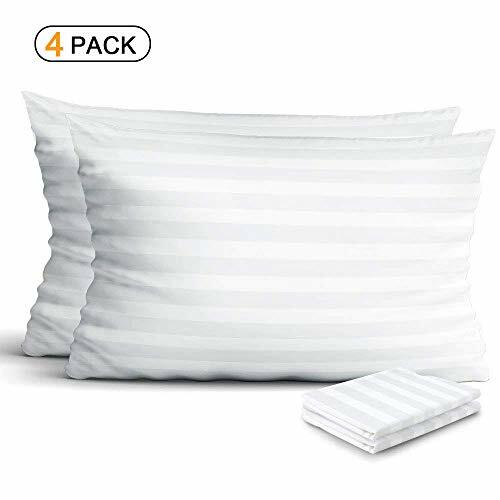 4-Pack 100% Egyptian Cotton Pillow Protectors, Zippered Allergy Control Pillowcases, Hypoallergenic Bed Bug & Dust Mite Resistant Anti-Microbial 300 Thread Count Sateen Pillow Covers, King by Haperlare at Netshop 234. MPN: LU-SL-20180529-CASEK. Hurry! Limited time offer. Offer valid only while supplies last. SUPREME QUALITY & COMFORT: Our 100% breathable Egyptian cotton zippered pillow protectors are made of high thread count cotton sateen weave fabrics that ensure a soft, smooth and noiseless look and feel. So you can get a cool, comfortable and allergy-free night's sleep! 300 THREAD COUNT TIGHT WEAVE: The 300 thread count tight weave pillowcases with a small pore size offer complete barrier protection, effectively block bed bugs, dust mites and allergens from getting through. They will also protect your pillow from saliva, perspiration, liquids, stains and basic wear and tear. ALLERGY CONTROL: Easy, affordable way to control sneezing, itchy throat, stuffy nose and other allergy symptoms. Hypoallergenic cotton won't irritate skin or interrupt sleep, so our pillow covers are safe for children and babies. FULLY-ZIPPED PROTECTION: Haperlare pillow covers ensures full coverage with a fully zipped enclosure and invisible zipper so you can rest easy knowing you're protected from harmful bed bugs, dust mites and allergens from all ends. EASY CARE: Durable cotton material tight weave resist shrinkage and maintain pore size through repeated laundering. Wash separately before first use, warm machine wash, tumble dry low. Do not bleach or dry clean. Available in three sizes, Standard 20" x 26", Queen 20" x 30", King 20" x 36". If you have any questions about this product by Haperlare, contact us by completing and submitting the form below. If you are looking for a specif part number, please include it with your message.